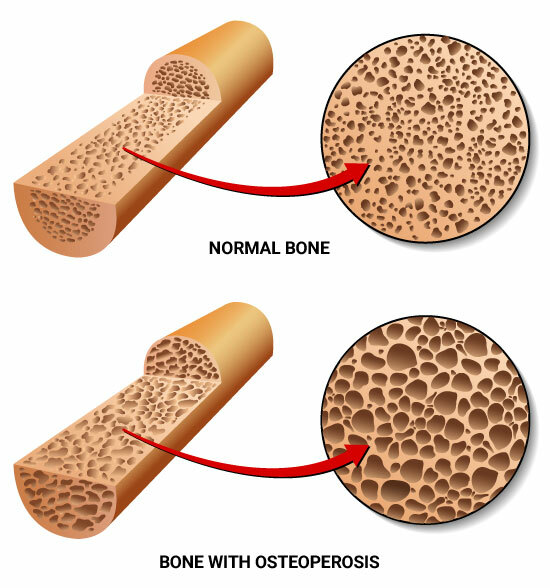 Loss of bone density can be diagnosed using a simple and safe bone scanning test called a “DEXA Scan.” If mild it is called "osteopenia" and if severe it is called "osteoporosis." As people get into their 50s, they sometimes get a loss of bone density (bone strength) as their estrogen or testosterone levels drop. This can also occur at an earlier age from drinking a lot of sodas (if you’ve had a bone fracture, consider stopping the sodas) or alcohol. The loss of bone density can result in spine fractures, resulting in loss of height and even a curvature/hump in the upper back, or hip fractures. If drinking a lot of alcohol, cut back as this can wash the nutrients out of your bones. Weight bearing exercise increases bone density. The standard medical treatment is to use expensive medications such as Fosamax (and other biphosphonates). If you have loss of bone density, it is reasonable to use these medications (usually for up to 5 years, after which they may cause more fractures than they prevent), but natural remedies are safer and more effective, even long term. As they are also cheaper, no one has paid to make sure your physician has seen the research on these natural therapies. Calcium is good to take as well, but is minimally effective (and dangerous) if taken by itself. It is much better to find a good bone health nutritional aid that includes other nutrients along with the calcium. Especially important is magnesium, vitamin D, vitamin K, and boron (take the mix at bedtime). Strontium (see below) is best taken at a different time of day, such as in the morning. This is especially critical for strong bones. For example, strontium has been shown to be 70 percent more effective than Fosamax, and much safer, in repeated, long-term, placebo controlled studies. Take 340-680 mg a day (the higher dose is twice as effective as the lower). Add bioidentical estrogen. Use BiEst from compounding pharmacies. The estrogen patches (e.g., Climara) are also reasonable. Add natural progesterone (called "Prometrium") and NOT synthetics like Provera, which I believe are dangerous. If testosterone levels are low, add 0.5 mg of natural testosterone. BiEst, progesterone, and testosterone can all be put in one cream by compounding pharmacies and applied each evening. Your physician can call in these hormones to ITC Pharmacy (at 888-349-5453) and they can mail them to you (and guide your physician on proper dosing). Check a testosterone blood level. If under about 450, a natural prescription testosterone topical gel can improve bone density.